The Church of Saint Henry has a great tradition for quality music and we are proud of that tradition. Those who are part of our music ministry, come to a greater understanding of liturgy itself. The Mass becomes more meaningful. We don’t just pick songs "out of the hat,” rather, our selection of music on any given weekend is designed to support the Scripture readings for that day. Those in music ministry also appreciate the fact that the songs we sing are really prayers set to music, so they value this opportunity to raise their minds and hearts to God in prayerful song. Being part of a music ministry such as ours at Saint Henry is spiritually enriching. This is a wonderful and enjoyable way of serving the Lord and our community. We’d love for you to join us. Those out of high school to those enjoying retirement are welcome to join our adult choir. 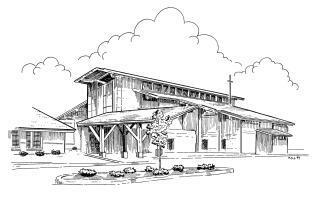 The Choir meets on some Wednesday evenings at 7:15 PM, usually two times before we are scheduled to sing at Mass. The choir usually sings one weekend a month. We sing a wide variety of musical styles from traditional to contemporary and everything in between. If you can carry a tune, please check us out. Sometimes this musical group is called our small groups. Many of the people that sing in these ensembles also sing in the Adult Choir. However, some like the small group feeling. These ensembles are the backbone of our music program because they assure us that we will have music at all of our liturgies. These groups sing a variety of music. Everyone is welcome to join a small group. Instrumentalists are welcome in the music ministry. If you play any instrument we will find a place for you. Guitarists, bass players, wind or string players, and percussionists are welcome. The Teen Choir is a group of young people who are committed to providing musical leadership for our worship at Mass. Teens range in age from 13 years and older. Practices are generally in the church during the school year on Wednesday evenings. We sing once or twice per month at the weekend liturgies. All levels of musical abilities is accepted, including singers, guitarists, keyboard players, brass instruments, string instruments, and percussion. This choir is for elementary school children through 6th grade who love to sing. Whether they sing on or off key, we’re not too fussy when it comes to the little ones. Give your child a chance to enjoy being a part of this group; they’ll love it! The Sound Board Ministry is seeking volunteers to assist in our worship by operating our computerized sound/video system for Liturgies. Training is provided.